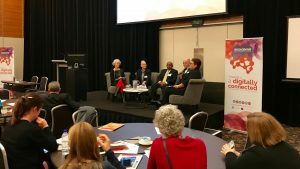 Smart tools were seen as the next phase in telehealth when health leaders met at the Broadband for the Bush Alliance annual forum in Fremantle, WA, last month. CEO of the Australian Digital Health Agency Tim Kelsey chaired a telehealth workshop panel joined by Melissa Vernon, from WA Country Health Service, Lucy Falcocchio, Kimberley Aboriginal Medical Services, Yogi Kanagasingam, CSIRO and Beth Sperring, Department of Health WA. Panel members provided a wide range of examples of telehealth including the case of a motor vehicle accident several hours from Perth. The accident happened at night in a region that had a small hospital with two nurses on duty. A number of the people had life-threatening injuries. Using the video conference link to the emergency telehealth service, the patients were triaged, assessed, treated and transferred successfully within appropriate timeframes. · The importance of relationship-building between the patient and clinicians. · Lack of MBS item numbers for telehealth across a range of services. · The lack of rigorous evidence demonstrating the financial and non-financial benefits. · More MBS items for telehealth – including a wide range of services. · Patient travel savings due to telehealth should be redistributed, including a significant portion to primary health care providers.